Absolute Beginners by Colin MacInnes comes highly praised and as touted by Paul Weller among others is 'the mod bible' but I'd argue that actually City Of Spades is the superior book. It's slicker, better paced, and less stodgy and so subsequently more engaging. 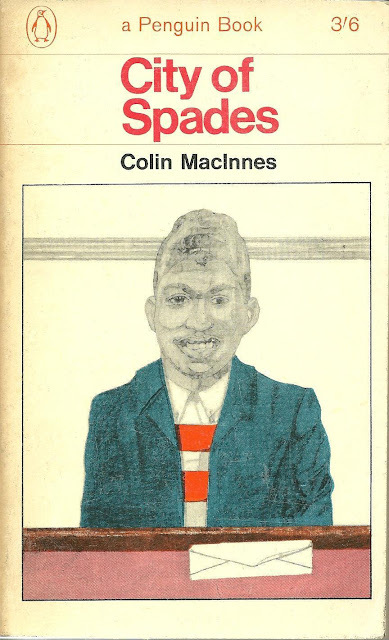 Apparently, MacInnes spent a lot less time thinking about City Of Spades whilst writing it than he did with Absolute Beginners, and this shows. The names given to the characters, for example, are the kind that might come in a flash of inspiration but if mulled over for too long might be dismissed as being too colourful: Billy Whispers, Jimmy Cannibal, Peter Pay Paul, Ronson Lighter, Karl Marx Bo, Alfy Bongo, Moscow Gentry, Norbert Salt, etc, etc. How could you possibly go wrong with such names? As for the title, 'Spades' means black people but any suggestion of racism regarding the term is dismissed very early on in the book in an exchange between the two main characters - Johnny Fortune, who is black and Montgomery Pew, who is white. It's Johnny Fortune who uses the term himself when talking about black people, with Montgomery Pew questioning if it's alright to use such a name? Johnny dismisses it as only a name said with some degree of cheekiness and no more insulting than the term 'jumble' that he uses for white people - 'jumble' meaning 'John Bull'. So, City Of Spades means literally 'city of black people', the city being London. And that's largely what the book is all about: London as lived in and experienced by black people in the 1950s when immigration from Africa and the West Indies was a new thing. Johnny's journey through London is followed; revealing an almost secret, underground metropolis to not only himself but Montgomery too, who had no idea such a world existed where cultures simultaneously intermingle and clash against a backdrop of music, drugs and the crumbling of Empire. Johnny's story is of a fall from grace; from pride and enthusiasm to world weariness and imprisonment, as he's battered and bruised by the ghosts from his father's past and the struggle to simply survive in the strange landscape of 1950s Britain. Why City Of Spades has never been made into a film is anyone's guess. It's there for the making with even a good twist at the end with Johnny about to get on a boat that will take him back home only to be informed that his nemesis Billy Whispers who wishes to see Johnny dead has just got on board also. It was decided instead to make Absolute Beginners into a film and a musical at that, starring Patsy Kensit. It bombed, and deservedly so; it's only saving feature being the Bowie song of the same name - and possibly Ever Had It Blue? by the Style Council. But I'll say again (and argue against Paul Weller) that City Of Spades is actually the superior book and would make a far better film but then compared to Absolute Beginners as directed by Julian Temple, that wouldn't be too difficult a task. Ah great to read this, glad you liked it. I never got round to 'reviewing' it as such (although I wrote about Absolute Beginners and Mr Love And Justice, both of which I really enjoyed too) so it was especially good to read your perspective here. However, I agree, City Of Spades could have made a great film. Have you read Mr Love & Justice by the way? I'd love to know your thoughts if you have/do. Well, thank you for recommending it, C. It if wasn't for you I'd never have picked it up. And no, I've not read Mr Love And Justice yet but I suspect I will - because I found and bought a copy of it at the same time as I found City Of Spades. You've become a cultural influence upon me!